What an adorable birthday cake! Too bad kids don't remember them, because we always remember the ones we make with love. Oh, where to begin? Your boys are darling. The cake is delightful. The party sounds perfect. And I love your take home gifts! All in all, a hearty, "Well done!" What a great idea to do the playdough for a loot bag! AW, Happy Birthday, Noah!!! Looks like he had a wonderful one! You're an awesome Mom! How many other moms put as much thought and work as hard to make their child's birthday so special? It would have been much easier and probably cheaper to just buy store bought stuff! I need to step it up for my babies! BTW, that frosting sounds GOOD w/a capital "G"! 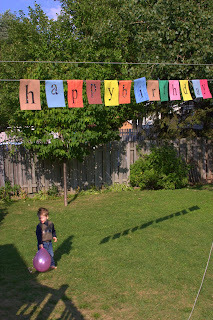 I LOVE the playdough, what a great idea, and so much cuter than plastic party bags! You should be really proud you did a great job, Happy Birthday Noah! Ok, that has got to be the cutest cake EVER!! And what a fun party gift - I'll have to remember that one! this cake sounds decadent, and it is absolutely adorable. i love it! That is one of the most adorable cakes I have ever seen! The cake sounds great but the frosting sounds incredible! For me, the cake is always just the vehicle for the frosting anyway. It's a beautiful picture as well! I'm really enjoying your blog! that cake is so adorable, and so are your kids! and homemade play-doh in those cute little packages! i wish i came to the party! I'm so stealing your party ideas for Jazz's 3rd! Hi Lydia- I know, it's more for us, really. Hi Lynn- You're too sweet! Thanks. I think the boys are darling too-they actually all wore their hats till the very end of the night. Hi Cheryl- Thanks, they were fun to put together. Hi Ingrid- Oh, there's lots of moms out there who are much more crafty than I! Thank you, though. Hi Hayley- I have as much fun with the play dough as my kids do! Hi Deb- Merci! What kids doesn't like play dough, right? It's non-toxic too. Hi Kim- Thanks! There was a lot leftover, but we didn't mind at all! Hi Patricia- I'll pass along all the birthday wishes. Thank you. Hi Andrea- You're right, the frosting was goooood. That cake is gorgeous! What a luck little boy you have! SO sweet...and i absolutely love the cake! i do appreciate the play by play of how noah reacted to events of the party. thank you for sharing. um, hope you don't mind if i steal-i mean borrow-the play dough idea? Your cake turned out perfect! It looks so good too! What a great party you threw! Happy Birthday Noah from all here! Looks like a fab party. Gorgeous cake, love the homemade playdough to take home too. The whole party bag thing is out of control. When I was young you got a piece of cake. A while back Little had a few friends back for tea. When it was time to go one of the kids really kicked off because there was no party bag. Aaarghh! Oh my. You are like the coolest. mom. in the world. the cake looks delicious! i see that you've called it a "banana chocolate chip cake" but i don't see chocolate in the ingredients or directions? how much and what kind of chocolate did you use? my mom use to make homemade playdough when i was little. so much fun! 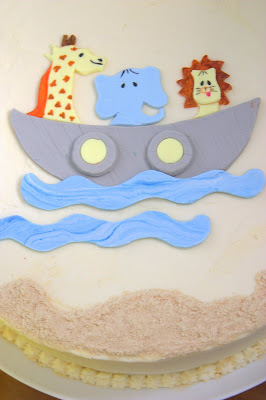 Such a sweet cake for your Noah! And those gifts to take home are such a perfect idea! What a dream birthday party. Happy 3rd Birthday Noah! Aimee, I hope you put your feet up and had a glass of wine after that one. That is the cutest cake! You are such a good mama. I wish I had you here to help me: I have to decorate a cake for my one year old nephew, and I know I'm going to screw it up. It has to be an Elmo cake. Yum! I'd take that cake for my b-day anytime. Hi Brilynn- If only he knew!! Thank you. Hi Abigail- Borrow away, darling. Hi Melody- You would do the same for your kids if you had some! Hi Amanda- IKWYM about the 'loot bag'. I'm new to these things but I can see it's going to get interesting. Hi Val- That is too cute! Hi Jaime- Oops! Good point, thanks. It's been corrected. Hi Recipe girl- He IS a sweet boy, so he deserved every bite! Hi Lyb- Isn't Mateo a honker? He's really filling out...and sitting up too! SUCH a fun stage. Hi Em- Elmo eh? Better dig out the food coloring. Are we going to get to see it? Hi Candy- Just let me know what your favorite animal for the top is, OK? that cake is so adorable and sounds delicious! Happy birthday! I love your Noah cake. You're right; your son isn't going to tolerate biblical pun cakes for much longer, although he'll probably come around to them again in adulthood. Noah is the best name. Last year I came to the decision that I was going to name my first son Noah. Not that I am, you know, married or pregnant or anything. I've just decided! How cute! I love that you made homemade playdoh for the favors. C'est une tres bonne idee! Your boys are so sweet! What a fun party - my cakes for Cash won't be as fancy, but they'll be filled with love, just like yours! This looks absolutely amazing. I love the maple frosting...it makes me want cake really badly right now.